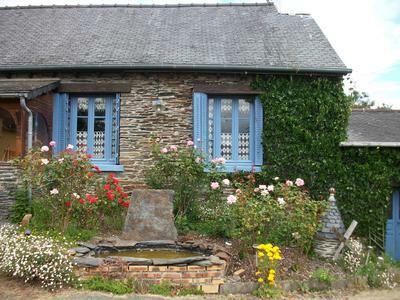 Detached Stone 3 Bed Holiday Cottage at Lac de Guerledan in Brittany. The location is stunning and very peaceful with just a 10 mins walk to the lake beach, restaurants, water sports at the lake beach area of Beau Rivage. The lake winds for 8 miles through a beautiful forest valley with miles of trails to explore. The cottage offers deceptively spacious accommodation with 3 bedrooms, large lounge, open plan kitchen diner, pretty gardens, ample parking and 2 acres of land to the rear. The bathroom has a newly fitted suite with large bath, wc, handbasin and free standing modern shower cubicle. The lounge has UK TV via sky, and dvd player. Being midway to the north and south coasts of Brittany it is ideal to explore the region in all directions (less than one hour drive to each coast). Rest of Year: £395 per week.